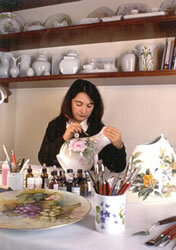 All the porcelains are entirely hand painted and decorations are painted exclusively by Maria Stella Lo Scerbo. The realization of each object begins with the choice of the porcelain to paint, concerning with not only the form of the object but also with the quality of the porcelain. They are favourite porcelains with simple lines of excellent quality, of Italian, French or German production. Then follows the search of decoration and subject to suit, looking for the inspiration and sometimes taking advices from the Masters of the past. She personally controls every phase of the manufacturing until the firing of the works at the temperature of 750-820 °C; almost all the painting techniques require more than one firing. The handicraft features of the production makes sure that each object is unique: although a piece can be realized more than once, the decorations will never be perfectly identical.